Roof truss saws are used to cut timber to size and shape ready for assembly and fabrication of wooden roof trusses. The work piece is fed to the saws under power, usually by a pair of chain conveyors. The saws are usually arranged in parallel pairs, one fixed and one moveable. This allows timber of different lengths to be produced. Each sawing unit can be fitted with several circular saw blades on independent spindles. Each blade can be positioned at different angles to produce the desired angle of cut at each end of the work piece. The use of roof truss saws will result in exposure to wood dust. 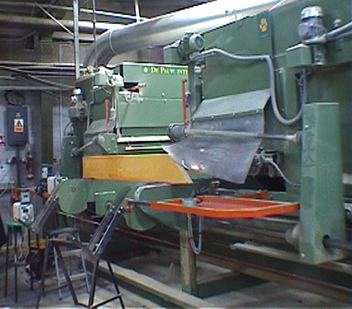 Newer machines that have been designed and constructed to meet BS EN 1870 -15:2012 Safety of woodworking machines — Circular sawing machines Part 15: Multi-blade cross-cut sawing machines with integrated feed of the workpiece and manual loading and/or unloading are required to have the facility for connecting them to a chip and dust extraction system. This includes the requirement for each saw unit to be fitted with a chip outlet at both the upper (adjustable) and lower (fixed) guards. The opening of the capture device should be large enough to capture the chips and dust that have been projected during cutting, see BS EN 1870-15:2012 for further details. Because of the potential health problems, wood dust is covered by the Control of Substances Hazardous to Health Regulations (COSHH). These set out the legal requirements to protect workers from health risks arising from hazardous substances at work. Under COSHH, employers (including contractors) have a duty to carry out a suitable and sufficient risk assessment and take steps to ensure they prevent or adequately control exposure. There are many older machines in use in the trussed rafter industry and some of these do not have adequate wood dust controls fitted. Wood dust is both a sensitiser and a carcinogen and exposure must therefore be reduced to as low a level as it is practicable to do so. HSE’s expectation is that woodworking machines such as circular saws that can produce high levels of wood dust should be fitted with local exhaust ventilation (LEV) to control wood dust exposure at source. airborne dust was present throughout the workshop for some time after sawing had stopped. Wood dust was also found to have settled on all level surfaces in the work area. personal sampling showed a reduction of dust levels of approximately 90%. Example 1 Local exhaust ventilation (LEV) retrofitted to a roof truss saw. Wood dust containment has also been made more efficient by adding a polymer sheet. 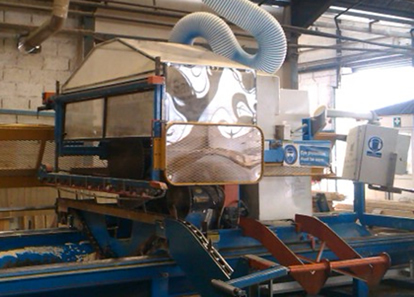 It is also possible to improve wood dust control by fabricating a frame and polycarbonate (or other plastic material with an equivalent strength) hood, as shown in the photographs of Example 2. Roof truss saws can produce varying noise levels, depending on the installation and configuration of the unit. The noise sources are the saw motors, the saw blades and the cutting action of the saws. The frequency (pitch) of the noise is related to the speed of the blade(s). If correctly designed, dust control hoods can also help reduce noise levels. For further in formation on these health hazards see wood dust and noise.